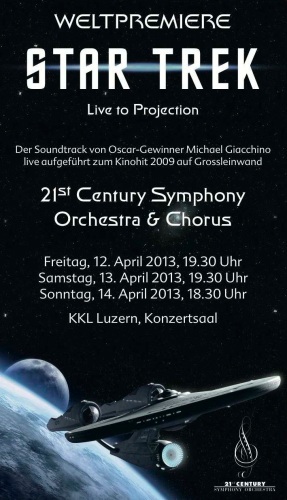 Michael Giacchino will perform the Intergalactic World Premiere of Star Trek – Live to Projection with the 21st Century Symphony & Orchestra at the KKL Luzern Concert Hall, in Switzerland today. In March 2012, allowed the 21st Century Symphony Orchestra, together with the Oscar winner Michael Giacchino, whose still young, celebrated but no less impressive film music scene. Now this fantastic collaboration between orchestra and composer continues with an intergalactic world premiere! The 21st Century Symphony Orchestra performs – together with the crowded 21st Century Chorus – Giacchino’s powerful score to “Star Trek” (2009) integral to the movie on the big screen on (original version with German subtitles). Together with the composer Michael Giacchino, and Paramount Pictures, the film music and film in months of work for this concert performance were reworked. The result is a half-hour spectacle in the best live-to-Projection tradition. An evening concert not only for ‘Trekkies’, but for all lovers of good music and breathtaking adventures.